dishes with Red Quinoa, yellow aji and other ingredients that are a distinct part of our culture and heritage, but still easy to find anywhere in the world. 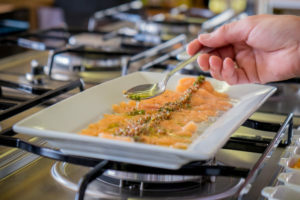 Our sophisticated, but easy to prepare dishes let you experience rich Peruvian flavors while providing you the expertise to demonstrate your new cooking skills back home. You will take recipes home for the two dishes you prepare, in addition to our famous Peruvian pisco sour cocktail. The class lasts approximately 3 hours.